Vietnam, officially the Socialist Republic of Vietnam (Vietnamese: Cộng hòa xã hội chủ nghĩa Việt Nam), is the easternmost country on the Indochina Peninsula in Southeast Asia. It is bordered by China to the north, Laos to the northwest, Cambodia to the southwest, and the South China Sea, referred to as East Sea (Vietnamese: Biển Đông), to the east. 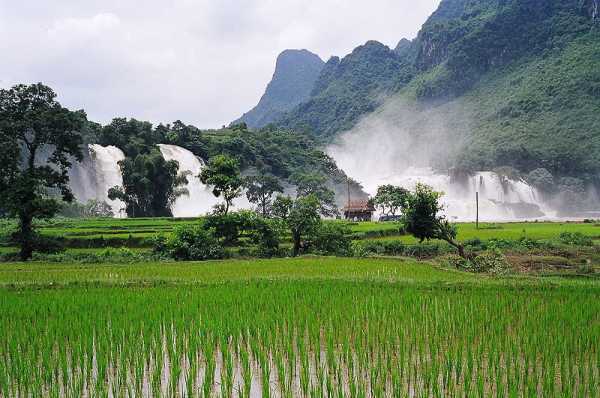 With a population of over 86 million, Vietnam is the 13th most populous country in the world. The people of Vietnam regained independence and broke away from China in AD 938 after their victory at the battle of Biển Đông river . Successive dynasties flourished along with geographic and political expansion deeper into Southeast Asia, until it was colonised by the French in the mid-19th century. Efforts to resist the French eventually led to their expulsion from the country in the mid-20th century, leaving a nation divided politically into two countries. Fighting between the two sides continued during the Vietnam War, ending with a North Vietnamese victory in 1975. Emerging from this prolonged military engagement, the war-ravaged nation was politically isolated. The government’s centrally planned economic decisions hindered post-war reconstruction and its treatment of the losing side engendered more resentment than reconciliation. In 1986, it instituted economic and political reforms and began a path towards international reintegration. By 2000, it had established diplomatic relations with most nations. Its economic growth had been among the highest in the world in the past decade. These efforts culminated in Vietnam joining the World Trade Organization in 2007 and its successful bid to become a non- permanent member of the United Nations Security Council in 2008. 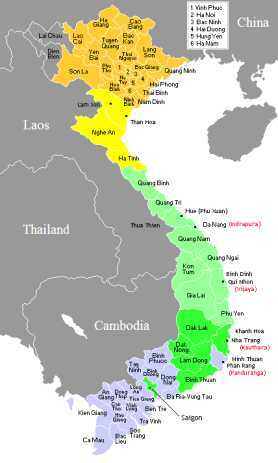 Việt Nam (Vietnamese pronunciation: [vjə̀tnam]) was adopted as the official name of the country by Emperor Gia Long in 1804. The name, Việt Nam, is variation of "Nam Việt," (南越, Southern Việt) a name for the country used during ancient times. In 1839, Emperor Minh Mạng renamed the country Đại Nam ("Great South"). In 1945, the nation's official name was changed back to "Vietnam". The name is also sometimes rendered as "Viet Nam" in English. The area now known as Vietnam has been inhabited since Paleolithic times, and some archaeological sites in Thanh Hoa Province purportedly date back several thousand years. 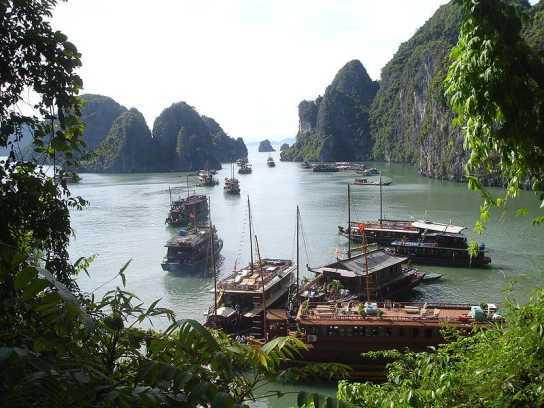 Archaeologists link the beginnings of Vietnamese civilization to the late Neolithic, Early Bronze Age, Phung-nguyen culture, which was centered in Vinh Phuc Province of contemporary Vietnam from about 2000 to 1400 BCE. By about 1200 BCE, the development of wet-rice cultivation and bronze casting in the Ma River and Red River plains led to the development of the Dong Son culture, notable for its elaborate bronze drums. The bronze weapons, tools, and drums of Dongsonian sites show a Southeast Asian influence that indicates an indigenous origin for the bronze-casting technology. Many small, ancient copper mine sites have been found in northern Vietnam. Some of the similarities between the Dong Sonian sites and other Southeast Asian sites include the presence of boat-shaped coffins and burial jars, stilt dwellings, and evidence of the customs of betel-nut-chewing and teeth-blackening. 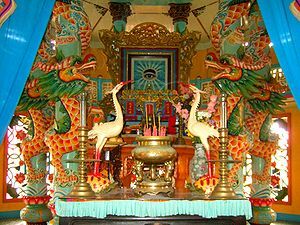 The legendary Hồng Bàng Dynasty of the Hùng kings is considered by many Vietnamese as the first Vietnamese state, known as Văn Lang. In 257 BCE, the last Hùng king lost to Thục Phán, who consolidated the Lạc Việt tribes with his Âu Việt tribes, forming Âu Lạc and proclaiming himself An Dương Vương. In 207 BCE, a Chinese general named Zhao Tuo defeated An Dương Vương and consolidated Âu Lạc into Nanyue. In 111 BCE, the Chinese Han Dynasty consolidated Nanyue into their empire. For the next thousand years, Vietnam was mostly under Chinese rule. 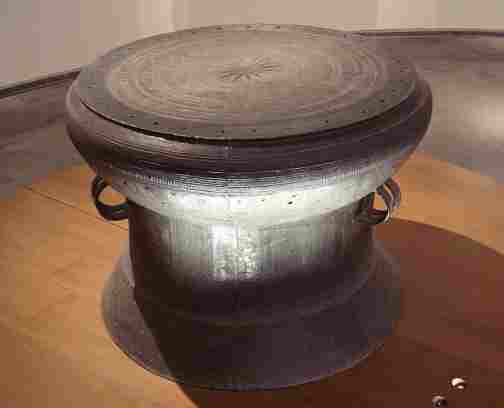 Song Da bronze drum's surface. Early independence movements such as those of the Trưng Sisters and of Lady Triệu were only briefly successful. It was independent as Vạn Xuân under the Anterior Ly Dynasty between 544 and 602. 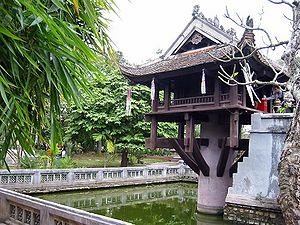 By the early 10th century, Vietnam had gained autonomy, but not independence, under the Khúc family. In 938 CE, a Vietnamese lord named Ngô Quyền defeated Chinese forces at the Bạch Đằng River and regained independence after 10 centuries under Chinese control. Renamed as Đại Việt (Great Viet), the nation went through a golden era during the Lý and Trần Dynasties. During the rule of the Trần Dynasty, Đại Việt repelled three Mongol invasions. Buddhism flourished and became the state religion. Following the brief Hồ Dynasty, Vietnamese independence was momentarily interrupted by the Chinese Ming Dynasty, but was restored by Lê Lợi, the founder of the Lê Dynasty. Vietnam reached its zenith in the Lê Dynasty of the 15th century, especially during the reign of Emperor Lê Thánh Tông (1460–1497). Tomb of Emperor Khải Định in Huế. Between the 11th and 18th centuries, the Vietnamese expanded southward in a process known as nam tiến (southward expansion). They eventually conquered the kingdom of Champa and part of the Khmer Empire. Towards the end of the Lê Dynasty, civil strife engulfed much of Vietnam. First, the Chinese-supported Mạc Dynasty challenged the Lê Dynasty's power. After the Mạc Dynasty was defeated, the Lê Dynasty was reinstalled, but with no actual power. Power was divided between the Trịnh Lords in the North and the Nguyễn Lords in the South, who engaged in a civil war for more than four decades. During this time, the Nguyễn expanded southern Vietnam into the Mekong Delta, annexing the Champa in the central highlands and the Khmer land in the Mekong. 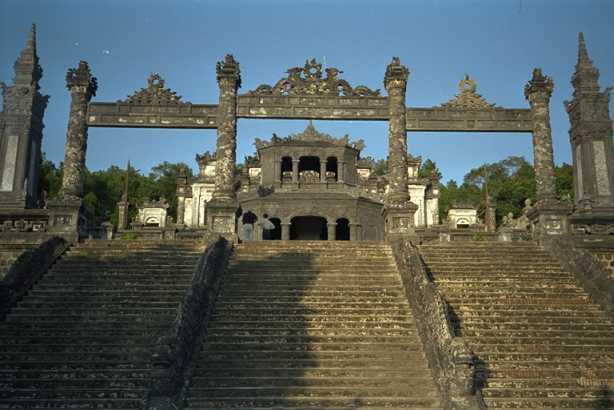 The civil war ended when the Tây Sơn brothers defeated both and established their new dynasty. However, their rule did not last long and they were defeated by the remnants of the Nguyễn Lords led by Nguyen Anh with the help of the French. 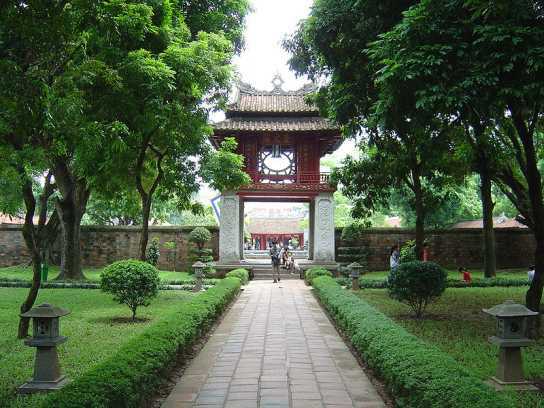 Nguyen Anh unified Vietnam, and established the Nguyễn Dynasty, ruling under the name Gia Long. Vietnam's independence was gradually eroded by France in a series of military conquests from 1859 until 1885 when the entire country became part of French Indochina. The French administration imposed significant political and cultural changes on Vietnamese society. 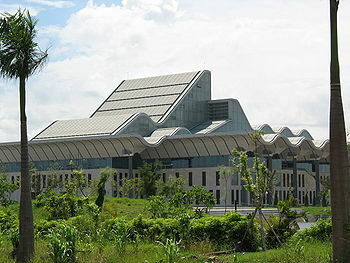 A Western-style system of modern education was developed, and Christianity was propagated widely in Vietnamese society. Most of the French settlers in Indochina were concentrated in Cochinchina (southern third of Vietnam whose principal city was Saigon). Developing a plantation economy to promote the exports of tobacco, indigo, tea and coffee, the French largely ignored increasing calls for self-government and civil rights. A nationalist political movement soon emerged, with leaders such as Phan Boi Chau, Phan Chu Trinh, Phan Dinh Phung, Emperor Ham Nghi and Ho Chi Minh calling for independence. However, the French maintained control of their colonies until World War II, when the Japanese war in the Pacific triggered the invasion of French Indochina in 1941. This event was preceded by the establishment of the Vichy French administration, a puppet state of Nazi Germany then ally of the Japanese Empire. The natural resources of Vietnam were exploited for the purposes of the Japanese Empire's military campaigns into the British Indochinese colonies of Burma, the Malay Peninsula and India. In 1941, the Viet Minh — a communist and nationalist liberation movement — emerged under Ho Chi Minh, to seek independence for Vietnam from France as well as to oppose the Japanese occupation. An estimated 2 million Vietnamese, or 10% of the population then, died during the Vietnamese famine of 1944–45. Following the military defeat of Japan and the fall of its Empire of Vietnam in August 1945, Viet Minh occupied Hanoi and proclaimed a provisional government, which asserted independence on 2 September. In the same year the Provisional French Republic sent the French Far East Expeditionary Corps, which was originally created to fight the Japanese occupation forces, in order to pacify the liberation movement and to restore French rule. On November 20, 1946, triggered by the Haiphong Incident, the First Indochina War between Viet Minh and the French forces ensued, lasting until 20 July 1954. Despite fewer losses — Expeditionary Corps suffered 1/3 the casualties of the Chinese and Soviet-backed Viet Minh — during the course of the war, the French and Vietnamese loyalists eventually suffered a major strategic setback at the Siege of Dien Bien Phu, which allowed Ho Chi Minh to negotiate a ceasefire with a favourable position at the ongoing Geneva conference of 1954. Colonial administration ended as French Indochina was dissolved. According to the Geneva Accords of 1954 the forces of former French supporters and communist nationalists were separated south and north, respectively, with the Vietnamese Demilitarised Zone, at the 17th parallel, between. A Partition of Vietnam, with Ho Chi Minh's Democratic Republic of Vietnam in North Vietnam, and Emperor Bao Dai's State of Vietnam in the South Vietnam, was not intended by the 1954 Agreements, and they expressly forbade the interference of third powers. Counter to the counsel of his American advisor, the State of Vietnam Prime Minister Ngo Dinh Diem toppled Bao Dai in a fraudulent referendum organised by his brother Ngo Dinh Nhu, and proclaimed himself president of the Republic of Vietnam. The Accords mandated nationwide elections by 1956, which Diem refused to hold, despite repeated calls from the North for talks to discuss elections. In July 1955, South Vietnamese President Ngo Dinh Diem rejected the nationwide elections agreed to by France and North Vietnam at the Geneva Conference of 1954. The pro-Hanoi Vietcong began a guerrilla campaign in the late 1950s to overthrow Diem's government, which an official Vietcong statement described as a "disguised colonial regime". In 1963, Buddhist discontent with Diem's pro-Catholic discrimination erupted following the banning of the Buddhist flag and the Hue Vesak shootings. This resulted in a series of mass demonstrations known as the Buddhist crisis. With Diem unwilling to bend, his brother orchestrated the Xa Loi Pagoda raids. As a result, America's relationship with Diem broke down and resulted in coup that saw Diem killed. Diem was followed by a series of military regimes that often lasted only months before being toppled by another. With this instability, the communists began to gain ground. There were more than a dozen governments before the pairing of Nguyen Cao Ky and Nguyen Van Thieu took control of a junta in mid-1965. 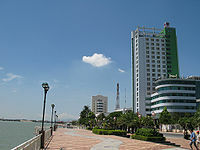 The side port of Da Nang. Thieu gradually outmanoeuvred Ky and cemented his grip on power in fraudulent elections in 1967 and 1971. To support South Vietnam's struggle against the communist insurgency, the US began increasing its contribution of military advisers. 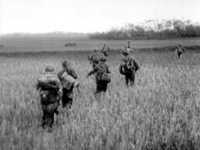 US forces became embroiled in ground combat operations in 1965 and at their peak they numbered more than 500,000. Communist forces attacked most major targets in South Vietnam during the 1968 Tet Offensive, and although their campaign failed militarily, it shocked the American establishment, and caused them to think that the communists could not be defeated. Communist forces supplying the Vietcong carried supplies along the Ho Chi Minh trail, which passed through Laos and Cambodia. The US president authorised Operation Menu, a SAC bombing campaign in Laos and Cambodia, which he kept secret from the US Congress. 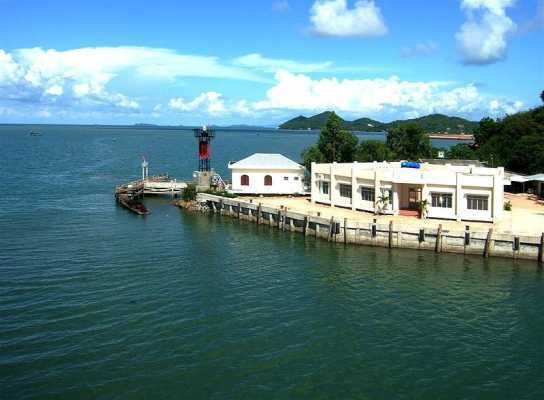 Coast guard station in Hà Tiên. Its own casualties mounting, and facing opposition to the war at home and condemnation abroad, the U.S. began withdrawing from ground combat roles according to the Nixon Doctrine; the process was subsequently called Vietnamisation. The effort had mixed results. The Paris Peace Accords of 27 January 1973, formally recognised the sovereignty of Vietnam "as recognised by the 1954 Geneva Agreements". Under the terms of the accords all American combat troops were withdrawn by 29 March 1973. Limited fighting continued, before the north captured the province of Phuoc Long in December 1974 and started a full-scale offensive, culminating in the Fall of Saigon on 30 April 1975. South Vietnam briefly come under the nominal rule of a Provisional Revolutionary Government while under military occupation by North Vietnam. On 2 July 1976, North and South were merged to form a Socialist Republic of Vietnam. "One pillar" pagoda, Hanoi capital. Upon taking control of the bomb-ravaged country, the Vietnamese communists banned all other political parties and forced public servants and military personnel of the Republic of Vietnam into re-education camps. The government also embarked on a mass campaign of collectivisation of farms and factories. Reconstruction of the war-ravaged country was slow, and serious humanitarian and economic problems confronted the communist regime. Millions of people fled the country in crudely built boats, creating an international humanitarian crisis. In 1978, the Vietnamese army invaded Cambodia (sparking the Cambodian- Vietnamese War) which removed the Khmer Rouge from power. This action worsened relations with China, which launched a brief incursion into northern Vietnam (the Sino-Vietnamese War) in 1979. This conflict caused Vietnam to rely even more heavily on Soviet economic and military aid. Cao Dai temple in My Tho. At the Sixth Congress of the Communist Party of Vietnam in December 1986, reformers, upset by the lack of economic progress after the Vietnam War, replaced the "old guard" with new leadership. The reformers were led by 71 year old Nguyen Van Linh, who became the party's new general secretary. Linh was a native of northern Vietnam who had served in the south both during and after the war. In a historic shift, the reformers implemented free-market reforms known as Ð?i M?i (renovation), which carefully managed the transition from a command economy to a Socialist-oriented market economy. With the authority of the state remaining unchallenged, private ownership of farms and companies engaged in commodity production, deregulation and foreign investment were encouraged while the state maintained control over strategic industry. 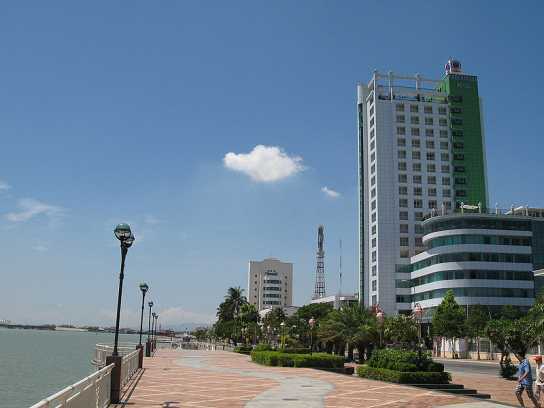 The economy of Vietnam subsequently achieved rapid growth in agricultural and industrial production, construction and housing, exports and foreign investment. This page was retrieved and condensed from (http://en.wikipedia.org/wiki/Vietnam) see Wikipedia, the free encyclopedia, November 2008.